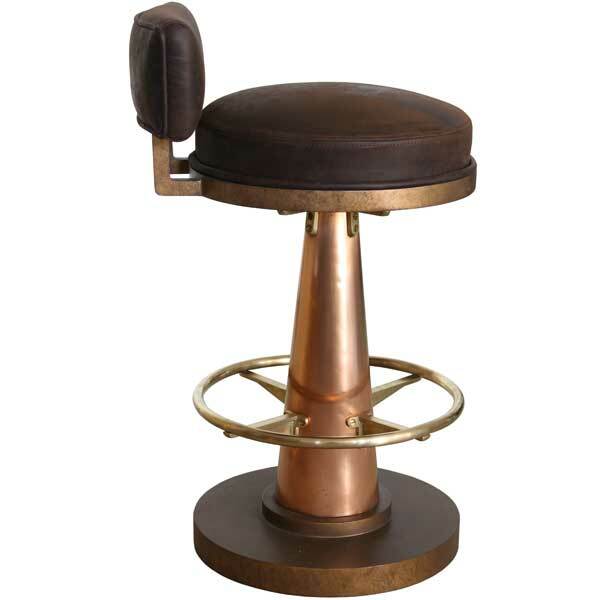 The design of the Copper Cone Bar Chair and Brass Cone Bar Chair was inspired by furnishings of the Art Deco period. Art Deco was an influential visual arts design style that first appeared in France just before World War I and began flourishing internationally from the 1920s thru the 40s. It took its name from the Exposition Internationale des Arts Décoratifs et Industriels Modernes (International Exposition of Modern Decorative and Industrial Arts) held in Paris in 1925. It is an eclectic style that combines traditional craft motifs with Machine Age imagery and materials. The style is often characterized by rich colors and bold geometric shapes. The Art Deco movement flourished during the interwar years when rapid industrialization was transforming culture. One of its major attributes was an embrace of technology. It has been defined as an assertively modern style that emphasizes symmetry rather than asymmetry, and the rectilinear rather than the curvilinear. During its heyday, Art Deco represented luxury, glamour, exuberance, and faith in social and technological progress. The Copper Cone Bar Chair and Brass Cone Bar Chair were designed for upscale homes, restaurants, cafes, brasseries, wine cellars, and bars. With their European style understated elegance, they make exceptional bar chairs for the game room, man cave, or home bar, especially when used with one of our freestanding bars or bar height tables. Constructed of robust (43 mils) copper or brass sheet, these bar chairs are also available as counter chairs. The copper or brass sheet is lightly distressed and antiqued for a mellow aged look. 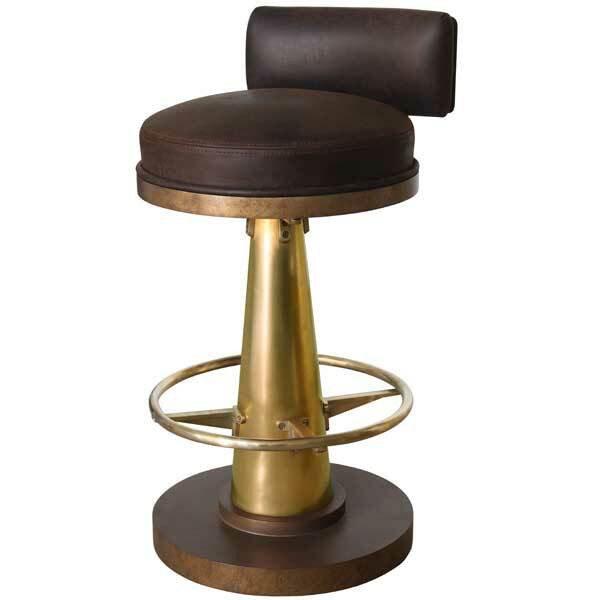 A brass footrest adds that special accent which sets these exquisite bar chairs apart from the average. Nylon glides are provided which will not scratch fine flooring. The cushion is upholstered in COM or COL. With 8-way hand-tied springs, the seat cushion will not sag even after decades of use. A useful feature of this bar chair is its memory swivel which is concealed under the seat. The metal plinth and seat frame are available in a variety of finishes. 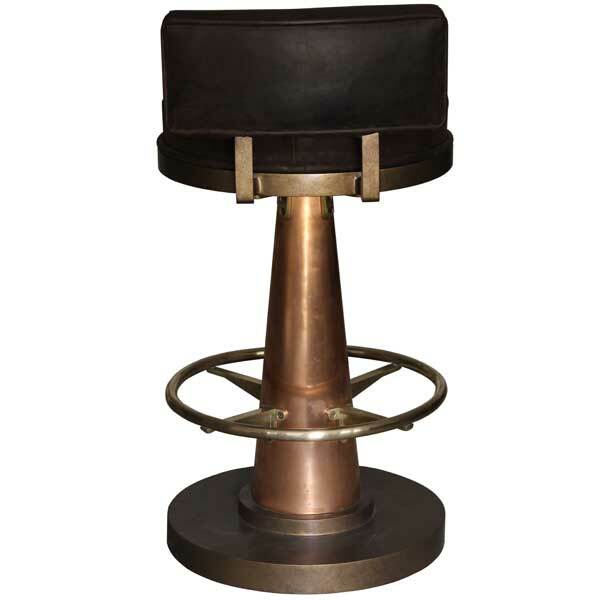 The Copper Cone Bar Chair and Brass Cone Bar Chair were designed by Shah Gilani, ISFD. Custom sizing is available.